Rubesch, T. (2010). Enhancing a self-access website. Studies in Self-Access Learning Journal, 1(2), 115-118. Since July of 2009, the Self-Access Learning Center (SALC) at Kanda University has maintained a student-oriented Let’s Study English website (accessible at http://elisalc.org). The website acts as an extension of the physical space of the SALC, supporting the Center’s commitment to student access to information and materials which suit individual students’ learning needs, abilities and preferences. It also widens the learning environment- enabling students to access SALC information and resources virtually anywhere at any time. Lastly, it helps promote a community of language learners, encouraging student involvement in Learning Center activities. With these values in mind, a team undertook the year-long “Enhancing the SALC’s Let’s Study English Website Project” in May of 2010. The purpose of the project is to increase student traffic to the Let’s Study English website and promote other existing technological resources related to the SALC (e.g. the Twitter feed, the Flickr photo page, the Facebook page, links to language learning activities and resources, and updates for SALC-related information). The project involves several enhancements to the website including some design changes and the addition, expansion, and updating of site features. The following work in progress report outlines the parts of the project, followed by some possible future directions which are planned for the months ahead. A group consisting of myself and two other interested colleagues created a wiki document to brainstorm, edit, and evaluate an ongoing list of potential Tweets (short messages) aimed at student users of the SALC. These messages are a mix of friendly time-sensitive bulletins such as reminders of upcoming workshops, events, or contests, and more general announcements such as features of the SALC or language learning suggestions. The Tweets are displayed on both the front page of the website and on the SALC’s Twitter page. To keep information relevant and dynamic, we update the Twitter feed approximately twice a week. The front page of the website also features a “window” to a page at the popular online photo sharing site, Flickr.com. Part of this project involved refreshing the visual and textual content of that Flickr page. 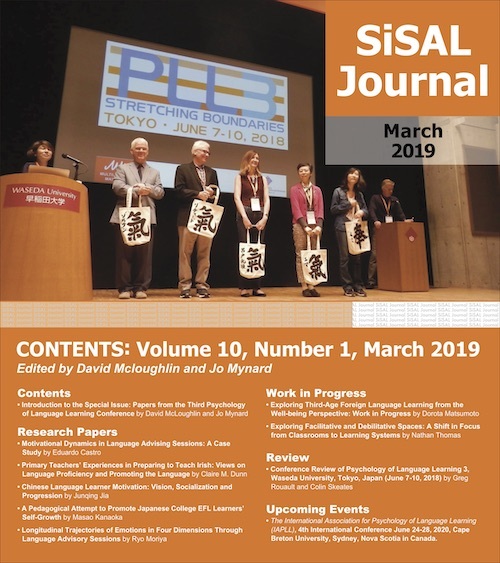 To keep it relevant and interesting for students, we broadened the nature of photographic content to include photos of the campus environment, students using SALC facilities, and social events related to the English Language Institute at Kanda. In addition, colleagues have generously donated their own photos to the Flickr page. Last semester marked the debut of online registration for the popular SALC workshop series. These one-off interactive workshops are presented by Kanda University lecturers for students to encourage independent study skill development as well as the use of SALC materials, resources, and facilities. Past workshops have addressed topics such as: learning English through popular movies and songs, developing communication skills, improving pronunciation, using test preparation materials, learning vocabulary, and thinking creatively. To advertise and explain the content of the workshops and encourage student attendance, we created and maintained the SALC Workshop Series page. This has proven to be a popular feature of the Let’s Study English website and nearly all of the twelve workshops were filled to capacity last semester. After some trial and error, we moved the Language Learning Activity and Resource links from an internal page within the site to a more accessible sidebar. Students have mentioned anecdotally that this was a helpful change as this location makes it easier to find the links they need. We created “What’s New in The SALC” archive on the website to remind site users of upcoming events at the Center. “What’s New in The SALC” an intra-departmental email sent to teachers and learning advisors at the beginning of each week. This memo is designed to help disseminate information about the SALC’s materials, workshops, events, programs, and developments to students via teachers in a timely manner. Its addition to the blog helps remind students and teachers of SALC-related information and also acts as an archive. So far, reaction to the project has been extremely positive. Visits to the site have dramatically grown from an average of about 750 hits per month in Fall Semester of 2009 to over 8000 hits per month in the Spring Semester of 2010, an average of over 250 visitors per day. Much of this phenomenal increase is likely due to the opening of the online workshop registration system mentioned above, but other site usage statistics show that users also spend time on the site’s front page where the Twitter feed, Flickr photo feed and resource links are located. Informal conversations with students have revealed that they use the Let’s Study English site to access information and learning materials as hoped. Colleagues have also been supportive and active in promoting and suggesting improvements to the site. Adding more SALC materials- especially technology-related materials such as instructions on using podcasts, karaoke, Skype and other technological applications for language learning. This would allow students to use internet-based materials through links directly off the SALC website when and where they are needed. Learning advice from students- a forum page as a place for students to share their language learning advice and resources with other students would help build community and disseminate ideas that work. A comments and suggestions email address where users could submit ideas for improving the website would allow students to request features or resources while they are using the site. Facebook integration- since Facebook seems to be growing in popularity among university students in Japan, expanding the SALC Facebook page could provide another avenue for community building and information updates through Facebook status updates. Suggestions from the results of the SALC Student Technology Use study. This study of students technology use potentially has much to show us about how students use language learning technology in the SALC and at home. These results will undoubtedly suggest further improvements to the Let’s Study English site. Certainly the next few months will hold many challenges, but so far this project has garnered support from colleagues, administration and most importantly, students. As technology trends change, so will student needs, but it is my hope that the Let’s Study English site will be around to support learners and foster community for a long time to come. Troy Rubesch is from Seattle, Washington in the Pacific Northwest of America. He completed his MA in Second Language Studies at the University of Hawaii in Honolulu. He is currently working at the English Language Institute at Kanda University of International Studies in Chiba. His research interests include CALL, distance and hybrid learning, student motivation, and materials development.